The more ubiquitous metrics like Corsi and Fenwick become, the stronger their skeptics will argue against them. Though modern analytics have now permeated big-time media and drawn the attention of renowned hockey personalities, they continue to be met with resistance among the more stubborn fans. Somewhere between the polarization of statistics acceptance and complete groupthink is a happy place where opinions may differ but people are knowledgable enough to understand what they’re disagreeing about. I maintain that much of the resistance against advanced statistics is born from a lack of understanding, or a lack of desire to understand. I’ll use Ottawa’s Erik Condra as an example. Condra has been a net relative plus for on-ice possession at even strength for each of his four NHL seasons, yet is seen as expendable by the majority of Senators fans. I’ve heard on multiple occasions that any metric which puts Condra ahead of say, Kyle Turris, must be wrong. What’s getting lost in the shuffle here is that Corsi is not the be-all-end-all stat its doubters perceive it to be. Condra’s CF% REL is telling us he sees a greater share of the 5v5 shot attempts directed at his opponent’s net relative to what occurs when he’s off the ice than Kyle Turris does. Nothing more. This is unequivocal as long as you put trust in the league’s trackers. There is an axiomatic truth regarding on-ice possession that is seldom spoken albeit intuitive enough not to have to be. Not all possession shares equal worth. The differences that exist between shot rates and shooting percentages while on the ice add or subtract importance to the minutes you play and in turn, the share of shot attempts you generate. At equal CF%, a first-line player’s minutes will hold more value than a fourth-liner’s due to the simple fact more goals are scored in those minutes. It is thus an oversimplification to compare Turris and Condra’s CF% ratings without proper context. A different way to look at possession is to examine the expected goal differential based on shooting percentages we can reasonable expect from the quality of the players on the ice. In other words, how rewarding are a player’s minutes at a set possession share? There is a great deal of noise there, which is to be expected when dealing with something fickle as shooting percentage. 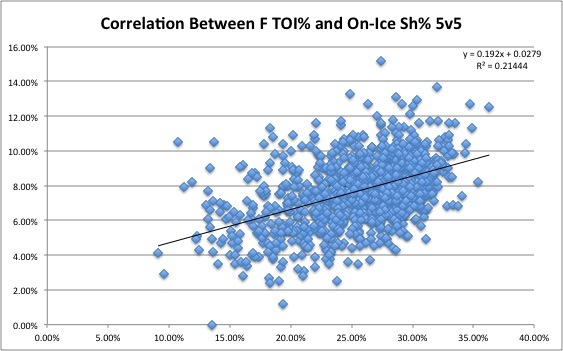 The correlation is nevertheless strong enough to make informed estimates and bring us closer to real GF% than straight Corsi by plugging F QoT TOI% and F QoC TOI% into the equation. Because there doesn’t appear to be any evident talent component to getting attempts on goal, I’ve used the league average 53.4%. Expressed as a raw differential between expected goals for and against, our measured value of possession does not yet account for team effects, minutes played or usage. Taking on-ice possession relative to off-ice and adjusting for games played, the Sedins of 2012 and 2013 left everybody else in their dust. There’s still sheltering bias to consider. There has been a lot of progress of late in adjusting shot-based possession for context of usage such as zone starts, QoC and QoT. In particular, @SteveBurtch has been doing tremendous work developing a metric he calls dCorsi, or Delta Corsi. Using multivariate linear regression, he can derive expectations for players’ CF% based on contextual stats. 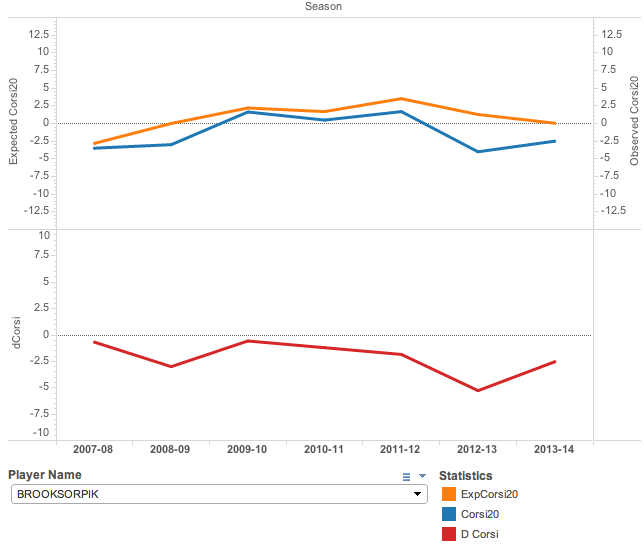 The difference between a player’s actual Corsi and that expected of him based on the situation he plays in is dCorsi. I believe there is a second way to look at how players perform in their match-ups. That is, how well must you perform in your time on ice to balance the advantage/disadvantage you leave behind in your off-ice match-ups? 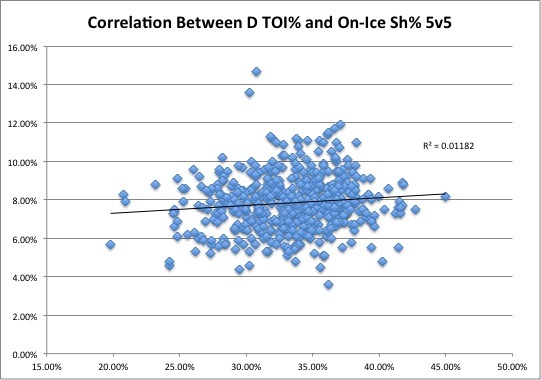 A player in the top percentile of F QoT who faces second or third-line forward competition inevitably leaves difficult leftover assignments for the rest of the team and must then do that much better in those minutes. In contrast, a player who fights above his weight class, so to speak, can be permitted a cushion of sorts due to the favourable matching that occurs while he’s on the bench by virtue of the tough minutes he played. It’s a tricky thing to derive expected shot attempt share based on player quality mismatches. Unlike the relationship observed between TOI% forward quality and on-ice shooting percentage, expressing possession as a function of discrepancy in quality is impeded by the fact tough minutes are often handed out to those most capable of handling them. Similarly, many of the players who face easier competition are in need of sheltering because of their inability to drive possession in its absence. I’d prefer to leave the task of defining a function for CF% dependant on off-ice talent to somebody more knowledgable than I. Instead, I examined the difference in expected off-ice goals based solely on the Sh% advantage resulting from the difficulty of off-ice match-ups. Evidently, this only represents a piece of the puzzle. It is the principle, however, that matters most. The shadow scatter on the red plane shows Net Reward plotted against Reward ON and the green plane, Reward OFF. That only expected on-ice goal differential shows any correlation indicates off-ice shooting talent plays a secondary role in defining value of possession. The data trend towards more sheltered minutes as Net Reward increases, so there is still sheltering bias here. The green points are risers, the red are fallers. The players who do better by net relative reward than simple Rel Corsi are those who face forward competition of quality far surpassing that of their linemates, and thus provide favourable off-ice match-ups for their team. Min. ∆CF% Break is the minimum difference in on-ice CF% required to match the expected off-ice shooting advantage associated with the discrepancy in forward quality. The data in red represent players who had to dominate possession while on the ice for their minutes to positively impact the team, and often did so. The match-ups leftover from those minutes, however, diminishes the value of the possession driven by these players. The numbers and rankings don’t mean nearly as much as the idea behind them and are, in fact, incomplete without a means of estimating expected off-ice CF%. However, they do offer a fresh perspective on the value of possession provided by a given player. One that belongs to a different paradigm then traditional Corsi or even dCorsi. Asking “How good must you be in your minutes?” is not the same as asking “How good should you be in your minutes?” Not all possession holds equal value — A first line player who dominates first line competition provides more rewarding minutes than a fourth line player who dominates fourth line competition. Revisiting Erik Condra’s case, you have a player whose expected goal differential is mitigated by the fact he plays in minutes that produce fewer goals than average. On the other hand, there is additional inherent value in those minutes because of the leftover match-ups. The net result is a clear positive and a ranking that remains above that of Kyle Turris, a player who did okay in minutes he had to do very well in. I believe this is a concept easily understood with a little reflection. 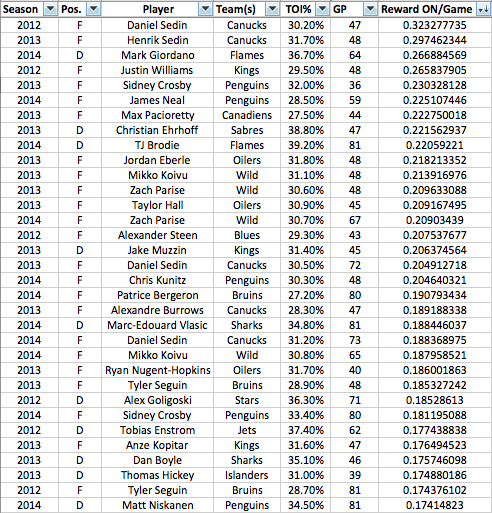 Like dCorsi, investigation past simple CF% comparison provides a far clearer picture and better tools for analysis. In order to make advanced stats more palatable to those averse to them, I think we need to de-simplify rather than over-simplify. It starts with making it understood that raw CF% and other shot-based possession metrics require significant context in order to provide reasonable assessments. There is no all-in-one stat in hockey I would trust to measure player quality on its own, and the best method involves looking at things in more ways than just one.